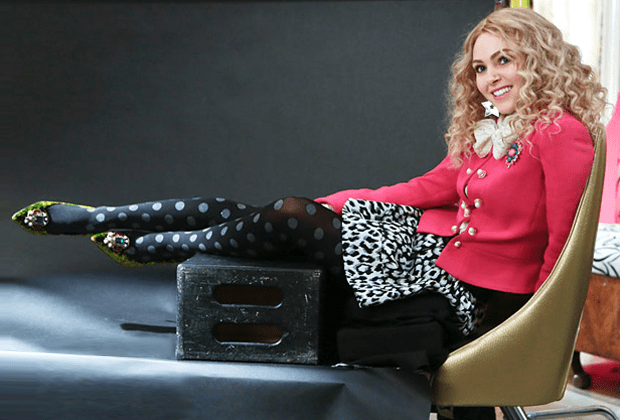 The teen Carrie (AnnaSophia Robb) receives her first pair of Manolos in this week’s “Hush, Hush” episode of The Carrie Diaries, a scene so momentous, costume designer Eric Daman had to find just the right pair of shoes. His pick? A pointed-toe, green lime green design, embellished with teardrop pearls and gemstones. “Talk about light on her feet! This shoe is practically illuminated from within!” Watch Carrie slip into her first pair of Manolos in The Carrie Diaries “Hush, Hush” episode on The CW. Read the full article by Jennifer Davis and see Carrie’s transformation at InStyle.com. This entry was posted on March 5, 2013, 6:04 pm and is filed under #FASHIONFIRSTS, ASK ERIC!, THE CARRIE DIARIES. You can follow any responses to this entry through RSS 2.0. You can leave a response, or trackback from your own site.